Mary Rajotte’s “Like Flies to Honey” is a creepy, increasingly claustrophobic story that explores the darker side of tradition. After living in The Estates for six months, Robert Blythe is still questioning why he allowed his wife, Leslie, to force him into moving. He doesn’t like the prestigious zip code or their mandatory events. Wanting to please his wife, he stuffs himself into a tux and attends a strange party held by the Apiary Estates Social League. But as the night progresses, Robert finds there is more to this ceremony than he previously thought. 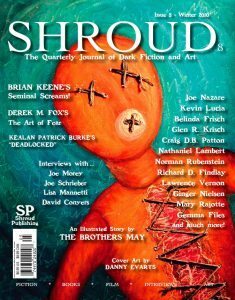 “Like Flies to Honey,” available in issue #8 of Shroud Magazine, provides a slow burn of paranoia and suspense. I flew through this story within a matter a minutes, then turned back to the beginning to start all over again. Rajotte has a way with description that had me marveling at the beauty of the vile. She spins the two together like fine silk until the reader has no recourse but to marvel that such a disgusting thing could be so wonderful. I’d quote a line or two here if not for the risk of ruining this fabulous story for the uninitiated. Buy Shroud #8 and turn directly to page 55. When you’ve finished Mary Rajotte’s story–and probably after you’ve read it a second time–go back and enjoy the rest of the issue. It’s well worth it.